named both after the soccer star and as an abbreviation for "peg-leg". 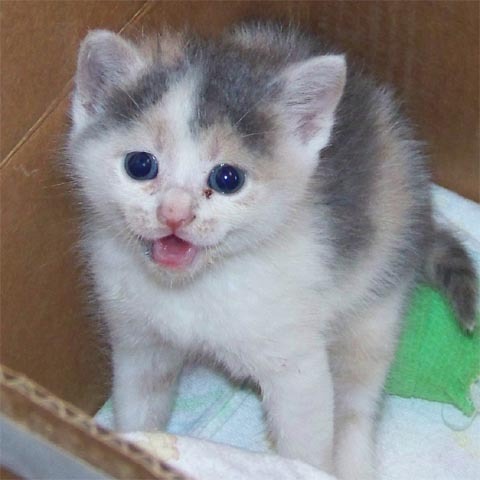 When she was brought to the King George animal shelter with her siblings, the ankle on her right hind leg had been crushed, and her leg was useless. The shelter splinted and bandaged Pele's leg before transferring her litter to Homeward Trails. Pele's leg was checked and re-splinted several times by Capital Cat Clinic during her tenure at 50K, and it healed so well that it was hard to tell she'd ever been hurt! We were amazed and grateful that she recovered completely from an injury that we thought might cost her her leg. By the time she was adopted (by a couple with a two-year-old male cat), she could run and romp and wrestle as well as any of her siblings. With her indomitable spirit and off-the-charts cuteness, Pele was one of our all-time favorites.